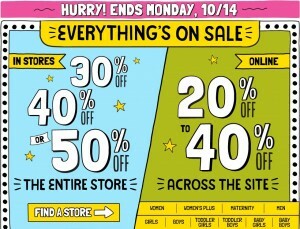 Old Navy is having a huge sale this weekend in-store and online, so make sure to check out all they have to offer. Shop in-store to get 30%-50% off the entire store or 20%-40% off online. Plus, don’t forget about the Old Navy Super Cash deal where you get $10 back for each $25 you spend online or in-store. If you haven’t signed up for their e-mails yet, sign-up to get an extra 20% off. If you need to complete your Fall wardrobe, you won’t want to miss this sale, but shop soon to get the best selection of sizes! Shipping is a flat rate of $7 or you can get FREE shipping on orders over $50.